Window sticker identifies fat-tired two-door from the 1970s as a Chevrolet Camaro. Every car tells a story, and some of the richest stories, we know, are told in Cuba. 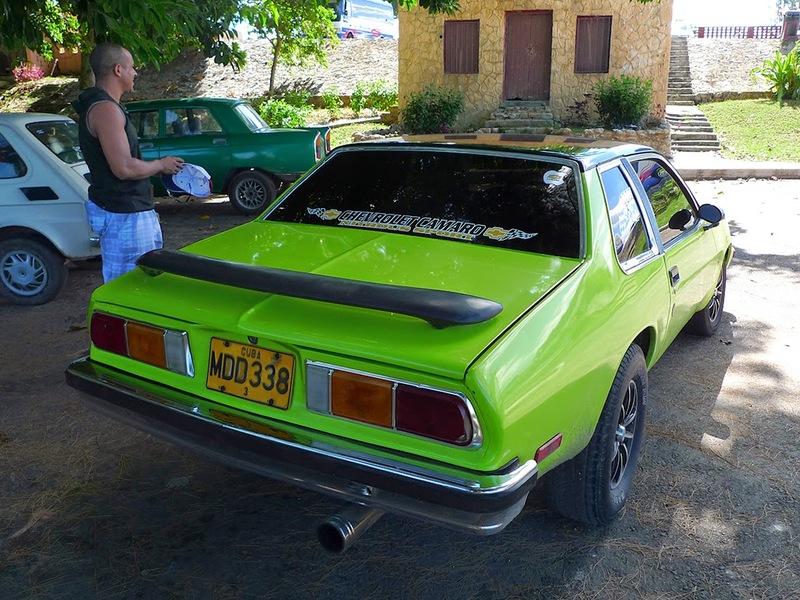 Consider this green muscle car from an era rarely seen on an island that has not imported vehicles directly from the United States since 1959. Not the case, I've since discovered. The name has always belonged solely to Chevrolet's distinctive long-hood, short-deck coupe and convertible. 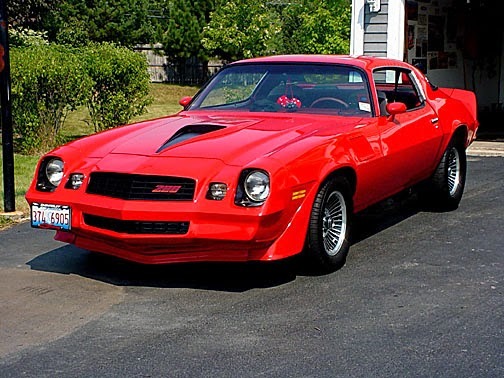 The real '79 Camaro, this one a sought-after Z28 / Wikipedia photo. So what is the green machine? The taillights reminded me of a 1970s Mustang II, but I was sure it couldn't be a Mustang, either. Turns out, however, that there is a sort-of connection. The car, I would eventually determine, is a Chevrolet Monza, a forgettable (for me, certainly) rear-drive subcompact built between 1975 and 1980 and based on the more memorable, though generally not for good reasons, Chevy Vega. The Monza 2+2 hatchback was actually quite sporty looking, but the Cuban car is the second Monza body variant, the notchback Towne Coupe introduced to compete with, yes, the Mustang II coupe. The "e" in Towne tells us sportiness was not a message the designers wished this model to convey. It does appear to be a 1979 Monza, so in year and in Chevrolet origins, the owner is correct. But did it really come from Canada, or did it make its way here from Mexico, or Venezuela? And who decided it to call it a Camaro, and why? Even if I knew the answers, I wouldn't share them with the owner. He already has a fine tale to tell. 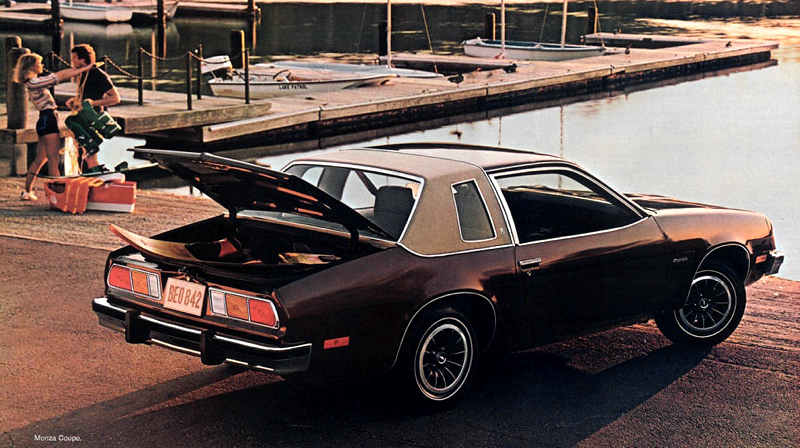 The Chevrolet Monza Towne Coupe, seen here in a manufacturer's advertisement, was a challenger to Ford's Mustang II. Hi, Rob - Sorry I haven't commented here since your blog about the '54 Corvette. Anyway, I can give you two examples of a car in Cuba being given a different name. One was a red '57 Thunderbird with an aftermarket tinted strip on top of the windshield that said "MUSTANG"(saw a picture of it in a car magazine article titled "Treasure Island").The other was an early '90s documentary on Cuba--I remember seeing the front passenger-side fender of either a '55 or '56 Ford---I noticed it had an emblem on it from a '70s era Ford Pinto. Incidentally, my parents also had a Monza (a '75 2+2 V-8 model to be exact). Thanks. Good to hear from you, Paul. I guess since so many other parts get mixed and matched in Cuba, why not names as well? Your parents' V-8 2+2 was certainly the Monza to have.